When you think of a well-maintained roof and attic, ventilation may not immediately come to mind. After all, isn’t the point of attic insulation to keep climate controlled air from leaking out of your home and driving your energy bills up? And shouldn’t the roof be sealed to keep moisture out of your attic so that your insulation doesn’t get water damage and/or mold and mildew growing in it? Yes, absolutely, you want to make sure that your home’s insulation isn’t compromised, and you certainly don’t want water leaking into your attic. However, that does not mean that you need to have your attic sealed up airtight. In fact, it actually means the opposite. A properly ventilated residential roof will help regulate the moisture in your attic, preventing mold and mildew from forming due to excess moisture in the air or water collecting on the floor and clinging to the underside of the roof. Excess moisture can cause damage to your roof, which will not be covered in your warranty, as an unventilated attic does not fall under normal wear and tear. In fact, even if your roof fails due to manufacturer defect, but you don’t have proper attic ventilation, your warranty could still be void. So what are the different solutions for proper roof ventilation and how do they work? Here’s an overview of residential roof ventilation basics and what you need to know to make sure your roof is properly ventilated. This basic ventilation system for your roof is built into the roof deck, along the ridgeline of your home. This is usually done when the house is first built but can also be performed if you are tearing the entire roof off to install a new one. To install the vent, a strip of roof deck is cut at the ridgeline, and the vent is fitted into it. For this kind of vent to work, you’ll have to make sure that no framing work impedes the vent’s opening. An attic fan can be turned on to draw air out of the attic. Older style attic fans had to be turned on manually, but these days you can get one that is controlled by thermostat or timer. If it is controlled by a thermostat, the fan will exhaust hot air out of the attic whenever the attic temperature climbs above a certain point. Exhausting hot air out helps your energy costs because you won’t have that hot air sitting in your attic, making your air conditioning system work harder as your insulation can only do so much against it. This is a good component for almost any attic to have, and you may want to look into a newer, more efficient one, even if you already have one installed in your home. Installed in the gables – the apexes of the vertical triangles created by a pitched roof – these vents allow heat out of the attic, but because they’re louvered, they prevent moisture from blowing back inside. A combination of gable and ridge vents can often mean the difference between a steamy, mildewy attic and a ventilated one with no mold problems. No matter what ventilation system you choose, remember that every vent system needs both entry and exit points for air to flow freely through your attic area. Without the ability to push air through and/or pull it out, you’ll be stuck with an unventilated area that will be susceptible to moisture damage, mold, and mildew. If you have any questions about ventilating your residential roof, don’t hesitate to give us a call. 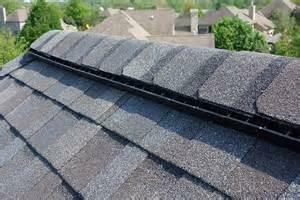 We have all kinds of roof ventilation solutions for your home.